Laura sat with Robert Imbriale during the Profit Conference in Carlsbad, CA to recap and share some of the best practices and the trends in this ever-changing, forever evolving world of social media, in a lively, fun and informative webinar broadcast that you may have seen in the last blog post. This is a summary and further explanation of the interview. When asked what the main thing in social media was in 2014, Laura said it’s definitely CONTENT. We know the importance of content last year and it will be even more important in 2015. She said Content is “The Marketing” by itself. By creating interesting and meaningful content that people will want to consume and be compelled to share, you let yourself stand out and be known to your audience and target consumers. Laura emphasized that visual content was big in 2014 but it will be huge in 2015. Case in point, the proliferation of Canva.com, an online tool you can use to create beautiful posters or images that you can use on social media. Plus it’s free. Anyone, can now be a graphic designer so there’s no excuse not to have a good graphic to accompany your post. Furthermore, make it a larger image (sized for the social networks to feature – minimum 800 pixels wide). There’s nothing better to illustrate the power of visual content than how Pinterest exploded in 2012-2013. If you think about it, every business has a visual component to it. There’s a ton of inspiring graphics you can develop whether it’s a beautiful product shot that stands out and grabs attention, a quote with a background image that makes an impact, or an infographic. On your business network pages showcase your work visually. It can be an image of your book, course titles, tagline, quote, professional shot of you, you speaking to a crowd or working with a client. Even LinkedIn has the option to put an image in their header to make your page as unique as you. You will connect more to your audience if you have appealing professional images. Here lies the challenge, how can you be noticed by your target audience among the sea of visually competitive organic posts and sponsored contents? Since the game has changed and a number of alterations are introduced to Facebook’s algorithm every now and then, it remains a challenge to be featured in your audiences’ newsfeed. Unless your post happens to go viral and gets lots of likes and shares, then the algorithm will kick in and put you on top. So what happens to the rest of your posts, you ask? How can you compete with professionally designed looking advertisement being prioritized by Facebook? Well, you can create visually compelling content. Include either a call to action, statement of benefits or simply add your compelling headline on the image. Grab your audience’s attention first with bright, colorful visual that stands out, and create the desire for them to click by offering a special discount or a free e-book. The reality is Facebook is Pay-to-Play. Advertising will be big in 2015. According to Laura. Facebook is even calling up small businesses to lure them to advertise. If you want your important content to be seen, you have to pay. It’s the (small) investment you have to make to see results. You might ask, what is the ideal budget for an effective advertising campaign? The answer is it depends. The good news is that the better you get in managing your content, the less you’ll spend. However, if you spend more, you get more positive results and more return on your investment. Your advertising spend will depend on your goals and your budget. The key is that to have a strategy in place and combine both organic and paid ads that will deliver your expected results. What if you don’t have the budget to play on Facebook? Laura advised some of her clients to not invest, but still have the presence for credibility so when your client searches you they will see your business page (other than your website), hence, making you a credible legit business. Laura instead recommends Google+ because it is an 800-pound gorilla as opposed to Robert’s perception of an empty warehouse . Google+ has amazing content being shared by a community of passionate individuals who love to interact with like-minded individuals. You can follow various interest areas and topics that you like and Google+ will deliver that content on your newsfeed. They also have recommendations based on your existing likes and interest. The beauty of being in Google+ is the Google juice! All your posts there are indexed by Google, so your content is searchable and gives you more SEO benefits. Another great advantage of Google+ is Hangouts on Air (HOA) where you can stream live interviews, Q&As, webinars, presentations, and it gets recorded and uploaded to your linked YouTube account. Best of all it’s free. Laura does HOA every week on Social Buzz Club and ditched her other webinar platform. In fact, she is producing HOA on behalf of her clients this 2015. HOA may be terrifying to some even the most experience speaker, but Laura said the more you do it, the better you get, the and more fun it becomes. The key to live video streaming is have a decent background, good lighting and good audio quality. For those who are panicking about the idea of being on camera and the learning curve, it’s OK, Breathe… Laura advises business owners to do what you love to do, stay centered and focus on what you want to contribute and you’ll be fine. Business owners can leave the high-end tech to the techies like Robert and professionals like Laura to produce their HOAs on their behalf. So, what IS the big thing in 2015 other than Big Data? Where do entrepreneurs who want to conquer social media focus their effort on? Two things: Paid Amplification (paid advertising) and Participation Marketing. We already know why we have to pay-to-play but what about the latter? Participation Marketing is using your existing customers as your brand ambassador by collaborating with them to create compelling and rich content. It could be in a form of interviewing clients, paying them to write blogs, mystery shopper or running a campaign that will produce quality contents like creating recipes using Nabisco cookies. Another big thing this year is mobile where integration of offline and online meets. One good example is Apple Pay, an app that lets you pay thru your smart phone, eliminating cash or even credit cards. Mobile is also becoming a ubiquitous device that most of us cannot live without, we even have a term for losing our phone, Nomophobia. Meanwhile 75% of Americans logged in on FB via smartphone. That’s why it’s more important than ever to have a mobile responsive website. In other words, a responsive and interactive website is critical to any business’ success. Your website is your hub online. Make sure it shines with consistent blog articles that showcase your expertise and you include a free offer to capture leads you can feel confident linking to it from social media as well as directing your networking connections there. Be sure to connect all your website, email and blog to all your social networks and vice versa. Think of it as a web with double head arrows . Link everything. Lastly, if there’s one word Laura can give, her best advice is ALIGNMENT. Be clear with your mission. Express it. Worry not on technology but your message, how you want to help people, serve your customers. Hone in aon what impact you want to make. And that to me, is the core of any strong business strategy. Kellie is an Independent Marketing Consultant and a Meeting and Events Planner with HelmsBriscoe based in San Diego, CA. She also was the Marketing Manager for a luxury brand in charge with brand’s marketing strategy execution in the market and it’s profitability. She is passionate about Social Media Marketing and works with non-profit organizations to plan and execute their digital marketing campaigns. 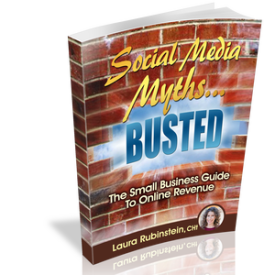 Laura Rubinstein is a marketing ROCKSTAR!